Southwest says that after its $1.4 billion acquisition of AirTran, open seating, no-fee bags and single-class service will remain. (CNN) -- Fares and fees. They're what air travelers watch, and Southwest Airlines' plan to acquire fellow low-fare airline AirTran has consumers and industry watchers buzzing about how the planned merger will affect the price of travel. AirTran will be absorbed by Southwest and adopt Southwest's policies, according to details of the $1.4 billion deal announced Monday. "We have open seating, we have no plans to change that. We don't charge for bags, we have no plans to change that. We have single-class service, we have no plans to change that," said Gary Kelly, Southwest's chairman of the board, president and CEO. So, it's a win for AirTran customers. "It's good news for AirTran passengers ... in general because Southwest has better service than AirTran and lower fees," said George Hobica, founder of Airfarewatchdog.com. Consumer advocate and HLN money expert Clark Howard sees the acquisition as a positive development for air travelers nationwide. "It's so good for the flying public. This is an opportunity for a discounter to have the kind of heft and national reach of the full-fare airlines," Howard said. Video: AirTran, Southwest merger OK for public? Hobica isn't as optimistic about the deal. While it's unlikely the acquisition will lead to higher fares nationwide, he expects other airlines, such as American Airlines and USAirways, to join in the wave of airline mergers that started several years ago. More consolidation is likely to mean modestly higher fares, he said. "But the thing is, fares can only go up so high before passengers say 'no thank you.' They're doing that now, they'll drive, they'll take the bus, they'll take Amtrak or they'll stay home," he said. With the recently approved United-Continental merger and the combination of Delta and Northwest, the number of legacy air carriers has dropped to four. Without AirTran, only two major low-cost airlines, Southwest and JetBlue, will be competing for American travelers. In markets where Southwest and AirTran compete head to head, such as Baltimore, Orlando and Milwaukee, prices are likely to go up if they combine. 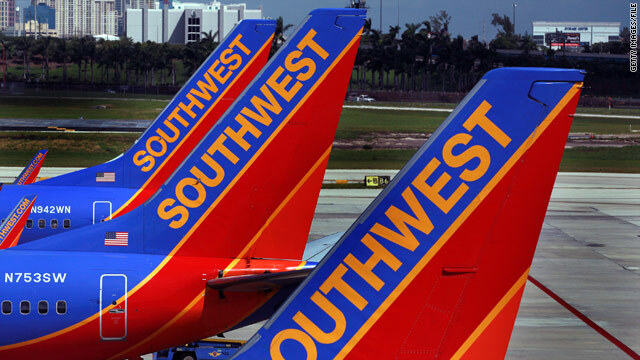 Consumers may find lower prices in Southwest's new markets. "New markets always mean cheaper prices, for a while, until everybody fights it out," said FareCompare CEO Rick Seaney. "And a competitor leaving a market typically means higher prices." Delta Air Lines, a key AirTran competitor, is likely to see the biggest impact in the near term, Hobica said. Both airlines have hubs in Atlanta, Georgia. "Delta has to decide now whether they're going to eliminate fees on competing routes from and through Atlanta," Hobica said. Delta led American carriers in fees for the second quarter of 2010, collecting $681.6 million, a 67 percent increase over the same quarter in 2009. Overall during the second quarter, airlines collected $2.1 billion in ancillary fees, which include charges for checked bags, ticket changes, pet transportation and other fees, according to the Bureau of Transportation Statistics. That figure represents a 15 percent increase from the same quarter last year. While the proposed deal's effects remain to be seen, some air fare analysts are pleased with the news. "I think America is going to very happy that now they can fly coast-to-coast between 100 U.S. cities and make the legacy airlines be more competitive with the style of Southwest and their low fees," said BestFares.com CEO Tom Parsons. CNN's Jesse Solomon contributed to this report.